Aquarium Lab is an application that enables you to track and log over 20 parameters for your aquarium. The application enables you to monitor water quality conditions such as alkalinity, pH and calcium, salinity, temperature and more. Moreover, Aquarium Lab enables you to calculate power consumption for your aquarium as well as track your inventory and tank expenses. 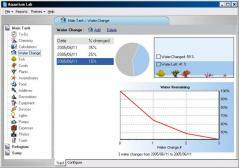 The aquarium parameters log as well as a generated graph can be posted on your website.